4. to contribute to European education’s excellence and competitiveness at international level within the European Higher Education system. MEDEG combines the complementary expertise existing at three leading European Universities into a common platform of graduate education and training. This objective is pursued within the guidelines of the Bologna process and aims to contribute to the development of the European Higher Education Area. * 10 (ten) Category A scholarships for students citizens of a Third country (with the exception of Turkey and Western Balkans) and who are not residents nor have carried out their main activity (studies, work, etc.) in any European country (as defined above) for more than a total of 12 months over the last 5 years at the time of application (ie. from December 1st, 2005, to November 30th, 2010). * 2 (two) Category A scholarships for students citizens of countries belonging to the so-called “Western Balkans and Turkey Window” and who are not residents nor have carried out their main activity (studies, work, etc.) in any European country (as defined above) for more than a total of 12 months over the last 5 years at the time of application (ie. from December 1st, 2005, to November 30th, 2010). 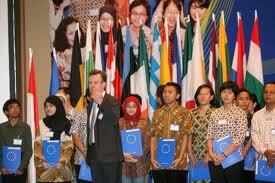 * 8 (eight) Category B scholarships for students citizens of member states of the European Union, EEA-EFTA states, and Switzerland, as well as to all non-European students who do not meet the Category A criteria as defined above. Demikian kami sampaikan tentang Erasmus Mundus MA Scholarships Economic Development and Growth (MEDEG) 2011 2012 semoga informasi tentang Erasmus Mundus MA Scholarships Economic Development and Growth (MEDEG) 2011 2012 ini bermanfaat.